Hair clips, statement earrings and medallion necklaces have been the headline accessories of the last 12 months, meaning our wrists have been a little neglected. Bracelets might have been overlooked, however, this season, charm bracelets, fine bangles, colourful bangles and dainty chains are taking over our Instagram feeds. Stacked, oversized bangles are the perfect companions to your chunky mohair knits whilst single bangles sit perfectly over the top of finer roll-necks. Coloured cuffs have undergone a grown-up, expensive makeover and are no longer just for holidays. New brands such as Kyoto Tango and Vanda Jacintho are creating gorgeous resin cuffs in bright colours that are wearable in any climate. 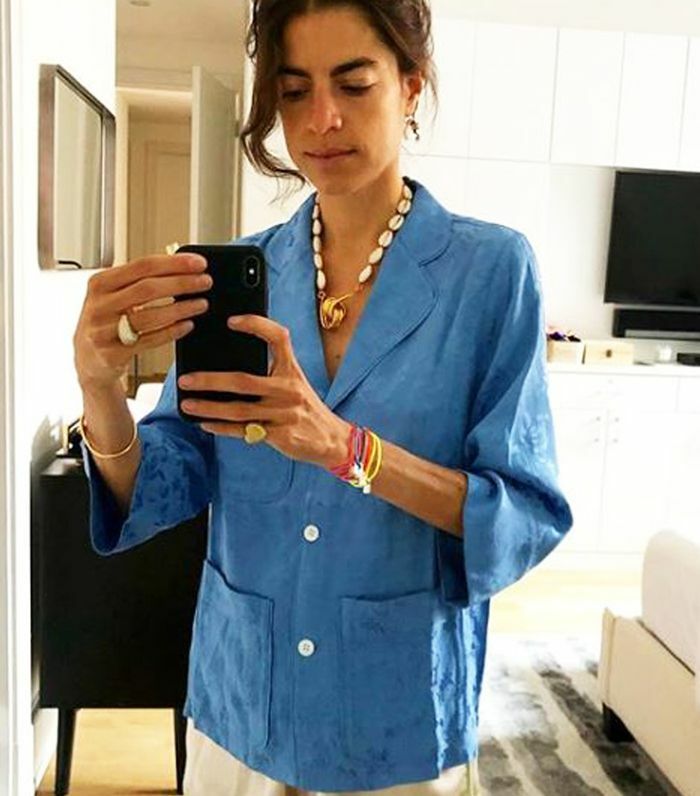 Leandra Medine, the inventor of the "arm party," always has the best bracelet collections. The biggest comeback of them all, possibly on par with the news of the Spice Girls reunion, is the return of charm bracelets. Almost all of our favourite jewellery brands—from Tiffany & Co to Missoma and Monica Vinader (and pretty much everyone else in between)—have included one classic charm bracelet in their latest collections. Needless to say, 10 years later, they are back on our Christmas list. Take a look at our edit of best bracelet trends to buy now—whatever your price range. Style Notes: Bangles have made a big return as of late, and frankly, we're over the moon. Go heavy duty like Pernille if you're wearing a single bangle, or opt for several smaller ones if you plan to layer them up. This arm accessory is the perfect partner for a chunky cashmere knit and also looks chic when styled over the top of fine-knit sleeves. Style Notes: This season, we've seen chains upon chains and that's exactly how we like it. All our favourite brands such as Aligheri and Wald Berlin are totally nailing this and even including keepsake-worthy pendants. These are ideal for everyday wear with jeans and chunky knits, as well as poolside if you're off to the beach. Style Notes: Coloured cuffs have just got a grown-up makeover, and Blanca Miro proves they are not just for summer. Stack as many of these up as you can and layer with other chunky gold chains. These will make any outfit feel seriously cool. Style Notes: Lucy Williams is the queen of barely there dainty chain bracelets. These are Ideal for stacking or worn alone for a more delicate look. Plus, they are so fine there's no need to take them off (ever). Style Notes: Charm bracelets may feel like a blast from the past, but Monikh Dale proves they're totally back in. From Burberry to Tiffany & Co, all of our favourite brands are doing them, the hardest decision is choosing the right charms for you. For more Christmas-gift ideas (or just a little end of year treat for yourself), take a look at these animal-print lingerie ideas.